When it comes to game changing infrastructure technologies, private clouds are leading the way toward new IT efficiencies and a simplified means of consumption. Building on their roots as virtualized data centers, private clouds are rapidly moving up the list of must have technologies to become an architectural standard for IT organisations around the world. 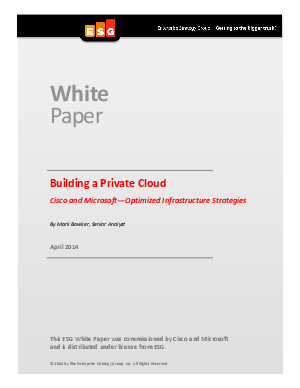 This white paper shows how Microsoft and Cisco have come together and developed a best-of-breed private cloud ecosystem that combines Cisco’s compute and network expertise with Microsoft’s single operating system, data management, and virtualization capabilities.